Alaa Abdelnaby was born June 24, 1968 in Cairo, Egypt and grew up in suburban Essex County. His family moved to the U.S. in 1970, living first in Nutley and then in Bloomfield. Alaa was big and athletic, with the size and skills to become a top high school center. He starred for the Bloomfield High Bengals, earning All-America recognition from Parade Magazine and McDonald’s. On several occasions he took off from the foul line and dunked, bringing fans to their feet. A solid student, he headed for Duke University on a basketball scholarship in 1986. The Blue Devils were coming off a near miss in the national championship game. Their inability to deal with Pervis Ellison of Louisville exposed a weakness that Alaa was expected to fill. Duke won 109 games in his four varsity seasons, reaching the Final Four in Alaa’s sophomore and junior seasons, and making it to the finals against UNLV in 1990. That season, he averaged 15.1 points a game and was named Third Team All-ACC. He played his best game as a collegian in front of friends and family at the Meadowlands in the East Regional final. 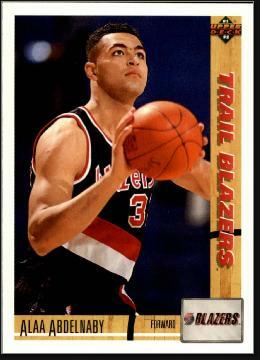 The Portland Trailblazers took Alaa with the 25th pick in the 1990 NBA Draft, making him the league’s first Egyptian-born player. He rode the bench for two years before becoming a starter in 1992–93 with the Boston Celtics. After one more season in Boston, Alaa finished his pro career with the Kings and 76ers in 1995. He played pro ball four more years, bouncing between Europe and the CBA. After basketball, Alaa got into broadcasting. He called NBA games for Arabic-language channels before settling in as a member of the 76ers television team. He also works for CBS and Westwood One on college broadcasts.